The following is an excerpt from the premium mid week update from the The Financial Tap, which is dedicated to helping people learn to grow into successful investors. They provide cycle research on a number of markets through weekly updates and the offer real time trade alerts to take advantage of market inefficiencies. They offer a FREE 15-day trial where you’ll receive complete access to all the valuable resources on the site. The miners have taken a 4 day beating and just like that (as warned in the weekend report) they gave back 10% of their gains. I was looking for at least a gap fill back at the $51.50 level and preferably a move back to the QE3 announcement lows, it’s essentially what we got today. It’s not in the least surprising considering the tremendous run and extremely overstretched nature of price. Anytime an asset closes well above its bollinger band while in the Cycle timing, it’s a call to stay away. So the miners are firmly back inside their upward Investor Cycle trend-line, in the end no technical damage has been done. All of the speculators who feared they were being left behind and added late are punished for their impatience. It’s never any different, any asset that stretches to that point will always suffer a mean reversal, the only exception being a parabola, which of course can run much further and faster than you could imagine. So is it happy times again? I doubt it; I believe the miners will continue to track the Gold Cycles. They are telling us that more weakness can be expected in the near future and therefore we should watch for further breakdowns. We’re now entering the 3rd month of this IC channel uptrend and members need to be aware that almost always these IC channels breakdown when moving into an ICL. The first step is the upside breakout with the top of the Cycle, followed by an eventual breakdown below to form the ICL. At this point I see no reason not to expect it again here. A move down below the trend-line to the $49.50 level would be a 38% retracement and a good “penciled” target for an ICL. Now you know why I didn’t buy recently when the trade was missed and instead let the miners run higher. I don’t like chasing a late Cycle mini-parabolic like run because I know they often do not end well, at least for those entering at the tail-end. I was able to do this because I was essentially emotionless to the trade. Having missed the earlier opportunity, I was content to see it go higher and catch the next low. It only served to have me focus on new opportunity and not stress about the missed one. 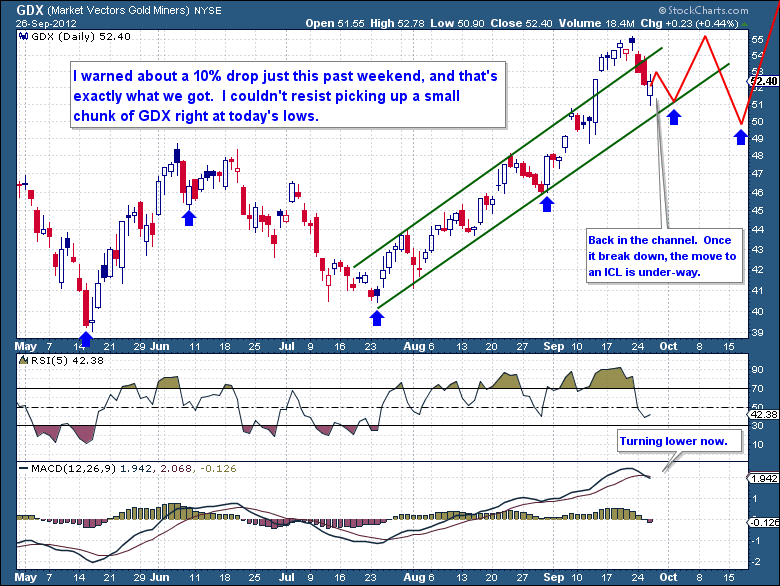 I bet you want to know, why did I buy GDX today if you believe we still have an ICL ahead? Rather simple answer, we did not have a miner position at all (Investor Portfolio) and I wanted to carry one during these times. As I had been expecting something similar to a 10% decline, I did not hesitate to buy when it was presented to me today. I was not expecting it this morning or so soon, but a 4 day (10%) free-fall is most often a good time to be buying. It may not be the lowest point between now and the next ICL, but it sure does provide us with a decent amount of cushion. So like the other Gold positions that I now consider “trading core”, I’m holding onto this 10% position as a base position in the event Gold is going to throw a Bull Market surprise. We now have more than enough of a core Gold position to capture any upside breakout or surprise. I know my Cycles framework is pointing to lower prices ahead and you need to be mindful and prepared for sub $1,700 Gold within the next 4 weeks. But my intuition tells me to stay focused and invested here, and therefore I remain committed, but not overly leveraged. In reality we should welcome my framework for a coming 5th failed Gold Daily Cycle because it will reset the Cycle clock and allow us to get very aggressive with the coming Cycle Low. If Gold is headed back to new all-time highs this year, we should be perfectly fine with a brief dip below $1,700 on the way there. Click here to be taken to the FREE 15-day trial.